Performance Time: Approximately 120 minutes, 96 pgs. DRAMA. 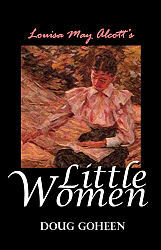 This adaptation remains true to the original novel and contains all the major events that made Little Women (1868) an American classic for both children and adults. The play opens on Christmas at the March home as the family tries to make the best of the holiday, though they have little money and Father is off ministering to Union soldiers. The play follows the March girls over 10 years as they grow into women. During this time, the family celebrates many joyous events including Jo’s successful writing career, the birth of Meg’s twins, Father’s return home, and Amy’s marriage. But these happy times are not without tragedy. Beth’s untimely death leaves the family reeling as they try to cope with the loss. However, in the end, this cheerful, wholesome family prevails in this heartfelt story of courage and love.